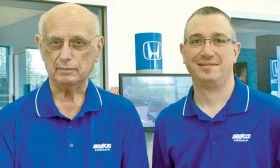 Adam Silverleib, right, who runs Silko Honda with his father, Ira, says they “treat people like a family” via SilkoCare, giving the store an edge. Silko Honda in Raynham, Mass., includes a free maintenance package and lifetime powertrain warranty with each new and used car it sells, which has helped it compete against two newer Honda stores nearby. A few years ago, Adam Silverleib found his family's Honda store facing a problem no dealer wants to confront: Not one but two new Honda dealerships were going to open within 15 miles of his Raynham, Mass., location. Competition in the Boston market is tough to begin with. Even after the downsizing of the Detroit 3 retail networks, the region is still heavily over-dealered, making for intense pricing and margin pressure. At times, Silverleib said, stores like his may average only about $50 in profit on new-car sales. With the addition of two points nearby, "the landscape was totally changed," said Silverleib, who runs Silko Honda with his father, Ira. "So we had to take a new approach and create something that gives people a reason to come to Silko." That something turned out to be an offering called SilkoCare. Launched in summer 2010, a year before the new stores opened, SilkoCare is a package of services included with every new and used vehicle sold at the dealership. It includes free maintenance for the first two years or 25,000 miles of ownership, discounted oil changes after two years, unlimited free car washes and a lifetime powertrain warranty. The response was much better than Silverleib expected. His service business has taken off, and the increased stream of service customers has opened opportunities for new-car sales, which are holding up amid the new competition. Used-car sales have increased, too, as has net profit. Perhaps most importantly, SilkoCare has developed fans like Michael Froio, owner of a 2014 Pilot and a 2012 Ridgeline, who chooses Silko over several other dealerships near his workplace. "Free maintenance is a big deal for me," said Froio, a law enforcement officer. "I trust their service department. They know my car. And I tell everyone in my family and all of my friends to go to Silko." It's a big deal for Silko, too. More than just a customer perk, it has become central to the 53-year-old dealership's identity. "This is all we talk about," said Silverleib. "SilkoCare is on our name tags, on every piece of direct mail. It's the focus of all our advertising. We don't sell the deal. We don't advertise 'Lease for this price or that price.' It's SilkoCare. That's our message to customers: This is why you should come here." Silverleib, whose grandfather founded the family business in 1962, grew up working sanding and priming fenders in the body shop. He received a degree in communications from Boston University, and then joined the dealership full time. In 2000, Silko Honda moved from Brockton, Mass., to a new building on Route 44 in Raynham, a town of 13,300 about 30 miles south of Boston. By 2010, Silko was selling about 1,000 new cars a year, pretty good for a family store competing against Honda franchises owned by giants such as Herb Chambers and Ernie Boch. But the outlook was clouded by news that new Honda points would soon open in Brockton and Plymouth. After some debate, Silverleib and his father concluded the way to respond was to turn what seemed like a weakness -- the fact that they are a single-point, family dealership -- into a strength. "You can go anywhere to get a big-box retailer experience," Silverleib explained. "We are a family dealership, so we have to treat people like a family. SilkoCare is how we do that." Silverleib declined to detail the exact cost of providing SilkoCare, but acknowledged that it does add to his expenses. He noted that he covers a number of powertrain claims each year. But he said he has found that free maintenance, free car washes and other services also help generate additional revenue. These days, Silko typically services more than 1,000 Honda vehicles each month, well above the expectations set by the factory, based on the units in operation in his area. Since SilkoCare is included with used cars also, the dealership has also seen a significant increase in non-Honda service. Any service visit, whether paid or free, also presents an opportunity to talk to customers about upgrading to a new vehicle. Froio, the law enforcement officer, recently had his Ridgeline serviced, and heard a redesigned truck is coming next year. "I usually only keep my cars for three years, so I'll be very interested in the new Ridgeline," he said. And because his service operations have strengthened, Silverleib said he doesn't have to rely as much on pushing new-car sales volume. "We've stopped taking loser deals," Silverleib said. "We don't feel like we have to chase crazy deals because we know people are coming here for SilkoCare."